The Cat Walk: Jackson Galaxy, a cat behaviorist and television personality, teaches The Times’s Stephanie Clifford how to walk her cat on a leash. THERE are outdoor cats and there are indoor cats. When I brought home Mac, a 4-year-old orange tabby, from a shelter last year, I realized I had acquired a demanding combination of the two. While he liked a cozy bed and two squares a day, Mac had a style that was apparently cramped by my one-bedroom apartment, and he dashed outside whenever I opened the door to my deck, returning hours later. The idea of walking him on a leash came after a series of unleashed mishaps. He killed a mourning dove, wounded a pigeon, tore a drumstick off a turkey that a neighbor had left cooling in his window and hung from another neighbor’s screen door close to midnight so that she awoke in terror. Mac wasn’t winning any friends in the apartment building. And I realized that letting a cat get into trouble seven stories above Brooklyn’s streets was dangerous. But when I cut off his access to the great outdoors, my cat, usually spunky and friendly, threw himself against the door, yowled and attacked my legs with frustration and sharp claws. I’d heard about cat walking on an Animal Planet show, “My Cat From Hell,” (its second season starts Jan. 7), starring a cat behaviorist named Jackson Galaxy. In one episode, he advised an owner to leash-walk his cat as a way to burn off extra feline energy. So I bought a Chihuahua harness and fastened it onto a writhing Mac. He keeled over and refused to budge until I removed it. Clearly, we both needed professional help. Mr. Galaxy is one of a growing number of animal behaviorists who believe that training and walking cats is not only possible, but good for the cat. They say that cats need lots of human attention, and are not the solitary, selfish creatures they’re often thought to be: less Mr. Bigglesworth and more Bustopher Jones, the cat about town. Because cats don’t learn by discipline, owners have only recently begun to see them respond to training as positive reinforcement has become popular, said Stephen Zawistowski, science adviser for the American Society for the Prevention of Cruelty to Animals. The antecedent is old, he said: Edward Thorndike’s circa-1900 puzzle-box experiments, proving animals could learn behaviors, were performed on cats. “People are developing a broader, more deep bond with their pets, and want to do things with them,” Dr. Zawistowski said. Walking a cat on a leash strikes a good balance between having an indoor cat that lives to old age but in an unstimulating environment and an outdoor cat that can kill birds or get killed itself. “Here’s a way for your cat to go outside and enjoy the outdoors, but under a protective umbrella,” he said. I scheduled a visit with Mr. Galaxy and set out to make Mac into a pedicat. With his bandanna, long goatee and many tattoos, Mr. Galaxy looked more like a Harley person than a cat person. He worked at cat shelters for nine years before becoming a professional animal behaviorist (he charges $375 for a two-hour in-home consultation), and believes that almost all cat problems can be solved. We started by settling on Mac’s reward: his favorite treats, meat-flavored biscuits called Greenies. From now on, “the only time you’re ever going to give that treat is when you’re working the harness,” he said. I fastened the harness on Mac, and Mr. Galaxy told me to give him a treat immediately. “He’s got to know this action equals reward, and he has an attention span of about two seconds,” he said. Mac, the author's tabby, shows how training and patience pay off. No pigeons or mourning doves were harmed during this excursion to the park. Then, he had me move a few steps away, shake the bag of food at Mac and call him. I’d move back, give him a treat when he approached, and repeat. After about 15 minutes in the harness, Mac’s tail was swishing and he had dropped to the ground. End it here, Mr. Galaxy said — you want to leave the cat feeling confident. During harness time, Mr. Galaxy was also constantly praising the cat with head pats and lots of “Good boys.” The cat nestled at his feet as soon as the harness was off. Mr. Galaxy left me with directions to break the walking-outside goal into small steps before finally going out on the street. “For every cat, this side of the line is comfort and on this side of the line is challenge,” he said. “Every day, your job is to keep him at that line and then put one paw over it.” By the next day, Mac started purring when I took out the harness and the treats. We did take it slow, though. Day 4, out on the deck, Mac would walk a few feet, then sink to the ground. Day 14, he would walk a few feet, then sink to the ground. Day 30, we had made it to the lobby, where he would walk a few feet, then sink to the ground. Or, for variation, he would run up the lobby stairs and hide. How to feel like a chump: standing in an apartment lobby with a clearly terrified cat, one that is wearing a leash. Mr. Galaxy advised that I make Mac walk a little longer between treats. And if he freaked out, I was to return to the previous setting until he was confident there again. Finally, Mr. Galaxy said, I needed to stop picking up the cat when he seemed nervous, an act that would undermine the cat and teach him to be too dependent on me. Residents in my building were starting to greet Mac by name, offer him a hand to sniff and ask me about walking techniques or whether they could walk their rabbit. And when we returned to the apartment, Mac would still attack my legs occasionally, but more often he’d rub against my legs then take a nap on top of the television. On the street, he was still timid. He would flatten himself when he saw a skateboarder, a cement truck or a dog. I figured that if Mac couldn’t relax on city streets, he might in a park. So I put Mac into his carrier, took the subway and, inside Prospect Park, attached his leash before letting him out of his carrier. The cat was black-eyed with fear and climbed up my jeans. I tried again, in a no-dogs-allowed area that was wooded and hilly. There, Mac pushed his head out of his carrier, looked around and took a few tentative steps. Then he was off. Tail up, head up, he ran along trails, stepped on logs and crashed through twigs. That cat was walking. He was moving in a way I’d never seen him move in the apartment, reacting to bird calls with ear twitches, walking leopard-like along fallen trees, burrowing his nose into holes and testing trunks with his paws. He wandered, turned and tangled himself in his leash, and he looked back at me every now and then to make sure I was still with him. Back home, he purred, curled up and slept for most of the day; this is your cat on exercise. Mr. Galaxy met me and Mac in the park on a cold December day to watch us walk. He was jubilant about the cat’s progress, but had some more advice. When Mac froze at the sight of a dog or a jogger, I shouldn’t freeze, but should calmly redirect his attention by calling him toward a different spot. Six months after I started, I have a relaxed cat, a new admiration for his pluck and agility and, probably, a growing reputation as the weird cat lady. Taking my cat to the park is a great outing, and if Mac is never going to trot alongside me as I walk to brunch, that’s O.K. He is a cat, after all, and I’ve learned that means he’ll only do what he wants to do. He’s trained me pretty well, I’d say. WISHING for a pedicat of your own? Here are tips from Jackson Galaxy for training your cat on a leash. 1. Know your cat. If it doesn’t mind being handled, is pretty confident and not easily spooked, it’s probably a good candidate for leash training. 2. Get the right gear. It is not safe to walk cats on a traditional collars; if they escape up a tree, a breakaway collar will detach, while a standard collar can strangle them. 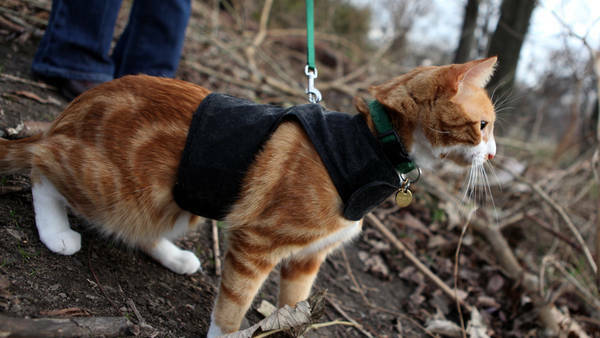 Mr. Galaxy prefers two styles of walking jackets, though a harness made for a cat is also fine. 3. Hungry is good. Many cats respond to food treats, so start with a hungry cat. Cut treats into tiny pieces, because when a cat gets full, it will stop working. Only give the cat treats when you’re doing the training, and limit the overall amount. 4. Start small. In the first session, place the harness on the cat with confidence, and fit it snugly but not tightly. The moment you’ve finished putting it on, give your cat a treat. If the cat then falls to the ground and plays dead, give it a treat if it moves at all. If it is willing to try walking in the harness, give it a treat when it takes a step. The moment the cat starts seeming overwhelmed, remove the harness and give a treat to end on a high note. Throughout the process, give lots of praise and head pats. 5. Set goals. Push the cat a little farther each day, by breaking up leash walking into small steps. When it walks around each new area with its tail up, it’s ready for the next step. 6. Expect some setbacks. If the cat is afraid of something, try to redirect its attention to another area. If the cat completely freaks out, retreat to the previous area you were walking until it is confident again. Try not to pick up the cat, which erases its confidence. 7. Be careful if your neighborhood has lots of off-leash dogs; consider taking the cat to an area that’s more protected. Don’t let the cat chew on or lick anything. Substances that are common on streets, like ethylene glycol in radiator coolant, taste sweet to cats but are potentially lethal, says Stephen Zawistowski, science adviser for the A.S.P.C.A. I enjoyed this story which makes me think of my neighbors' cat, which is an outside cat. I live in a suburban cul-de-sac, and when my neighbors take their dog around the cul-de-sac for a walk on a leash, their cat trots alongside, tail up, looking as happy as can be. It is the cutest looking cat I've seen. When they stop to look at something on their way, or chat with someone, it stops too. When they proceed outside of the cul-de- sac further on their walk, the cat stays behind. It's just the cutest cat. However, this very same cat drives me a little nuts, chasing and sometimes killing adorable chipmunks and beautiful songbirds in my back yard but when I see it sauntering on these walks, my heart melts and for a few moments, I can't be mad at it. If only my neighbors could read this article now and turn their outdoor cat into a well-walked indoor cat, maybe we could all be happy, especially the chipmunks and songbirds! Dec. 30, 2011 at 3:12 p.m. I'm glad to see that cat-walking is getting more attention. I used to walk my old cat in Central Park on a leash, and he loved being outside and socializing with other people even other dogs! Although Boo Boo was an apartment cat he used to live on the street, and I think being outside with his family gave him a sense of adventure as well as some sort of security. Dec. 30, 2011 at 2:41 p.m. It makes me happy to know that people are beginning to train their cats, especially using positive methods. Typically, we really expect less from cats than we do dogs (use the litter box and don't destroy things), and as mentioned in the article, cats are not necessarily "easy to please", though neither are dogs. The proper treats can be motivating for either; after all, we all like working for a paycheck! Dec. 30, 2011 at 1:59 p.m. Readers should keep in mind that "indoor cats" who take walks on a leash outside are subject to ticks, fleas, rabies, and more. Makre sure your pet is up to date on vaccinations before going for a walk. Dec. 30, 2011 at 1:51 p.m.
My Siamese adopted us here in Mexico almost 3 years ago--she showed up in our house hungry, dirty, scared and adorable. Suki is allowed outside by herself here because we live on a quiet street, there are no predators and we have a walled yard which she rarely leaves. She loves climbing the palm trees and hanging out in the warm sun all on her own. On Cape Cod where we summer, we have more road traffic and we have coyotes, so I bought a harness and leash, threw it on her and headed outside. She LOVES it--we have a routine which includes walking the beach, sticking her paws into chinks in the stone wall--hoping to find a chipmunk--a little gardening and some squirrel and bird stalking. I cannot say I walk her--really I go where she wants to go--but it's a nice part of our day. She gets exercise and stimulation and I get a few minutes of peace and quiet outdoors with my girl. Dec. 30, 2011 at 1:38 p.m. In response to Ania about how to approach harness training with more than one cat. I don't know what Mr. Galaxy would say, but from our experience it can be helpful if two cats who are already comfortable with each other learn to walk on a leash and harness. I don't know how many cats you have, but you will have to use your best judgement on which cats to train on a harness first. I would choose the most confident cat, which should then show the other cats that it's OK to be wearing a harness. Be sure to let them get used to the harness in their OWN HOME first. Make wearing the harness a fun time, and be sure to play with them while they are getting used to wearing it. Do this before taking them outside. There's a good write up on "Encouraging Your Cat to Walk on a Leash" at www.facebook.com/jafariunderfoot. Just scroll through the postings and look for the article. Hope this helps. Dec. 30, 2011 at 1:16 p.m. I might get one of these jackets and try again, I guess I moved too quickly trying to get my cats to take a harness - putting it on and taking him outside did not go well! 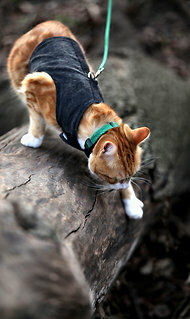 But I like the idea of the cat jacket better - I think the cat would feel safer than with the standard harness. For now I'll get one of those and give it a try. I'm an apartment dweller, but have long wished for my own home in order to get a cat fence installed so to make it safe for the cats to roam freely outdoors within a contained area. I recommended this idea to a former colleague with cats who got a cat fence and said his cats love it. This could also work for patios, I'm pretty sure. Question: for multi-cat homes, should a person get cat jackets for all cats and attempt to work with all at once, or just take turns with their cats putting the jacket and doing the treat training with only one cat? What does Mr. Galaxy say about that? Dec. 30, 2011 at 12:09 p.m.
Hi Ania - I didn't ask Mr. Galaxy about this specifically, but I have heard from owners of multiple cats about their methods. They generally get one harness for each cat (the harness should fit the cat very precisely, so buying a few is easier than constantly adjusting a single harness). And they do the training and walks separately as well. Mr. Galaxy emphasized that a cat has to take training at his own pace, so going one-by-one would seem to be the way to go. Not a professional opinion, but I hope that helps! Dec. 30, 2011 at 1:23 p.m. While I believe the author's heart is in the right place, I think the article ignores some basic threats that can be devestating to a leashed cat. What is one to do if an agressive unleashed dog is roaming around his property and see's your leashed cat? If he comes racing towards it to rip it to shreds, do you drop the leash and let your cat try and run away? Cats need to be able to use their ability to run up a tree when they see dangerous predators that could kill them, and there is very little a pet owner can do to shield their cat from a large agressive dog that is racing towards them. There are just too many hazards related to leash walking. Unless you have a large private property, it is best to keep your cats indoor from day one. If they have limited or no knowledge of the outside world, they will not be clamoring to get out. They will be safer as a result, and not susceptible to many of the various diseases that only outside cats can aquire as well. My Tenzing has been walking with a harness and leash since he was 4 weeks old. I'm an artist, and he travelled to his firs craft show with me when he was 6 weeks old. He does elevators, motels and hotels, boats and cars - loves road trips! The main thing is to realize you, the human, do NOT walk the cat - the cat walks you! When we do long outdoor excursions I carry his travel bag with me, and when he gets tired he will stand up against me asking to ride for a bit. In the summer I'll have a battery operated fan that blows in, and water to drink whenever he wants it. He has toured Gettysburg and Manassas battlefields very happily this way.. much to the surprise of others on the public tour who were used to dogs on leashes, but not to cats! It also makes it much easier to take him to the vet. My older cats have never been harness or leash trained. All new cats in the future will absolutely learn to wear a harness and go out on a leash - it makes life for both of us much easier and more enjoyable! Off to take Tenzing for a walk on the beach now...he's letting me know he is ready! We go the combo stroller/leash route, leaving the openings in the stroller open so the cat can poke her head out and survey the cityscape as we stroll. When the mood strikes her, she hops out and walks alongside. If frightened, she simply jumps back in her stroller. She also uses her stroller as her Trojan horse, ducking inside when "hunting" wildlife. Alas, she is not permitted to actually catch said wildlife, but she can approach them incognito. I spent perhaps 30 minutes teaching her to walk on a leash (using a jar of baby food since she does not like treats). And of course, we did provide the stroller. The rest is completely her idea. I don't understand what the fuss is about cats killing birds in the article. I'm grateful my city cat keeps any unwanted pigeons out of my small yard. Here is a tip that might help those who have cats that for whatever reason, go outside: I had a cat who absolutely insisted on being outdoors, and although she always came in at night (to be fed - a good ploy) I was not happy about the occasional bird deaths that ensued. I finally came up with a solution that worked for many years. I made little "necklaces" for her out of stretchy elastic cord, with several (at least five) round jingle-type bells strung onto it. The more the better, actually. The large number of bells meant that even a small movement on her part alerted birds to her presence, and the elastic meant that she could slip out of the collar if she had to. In fact I would occasionally find her jewelry around the yard. She lived a long and very happy life. I've walked several of my cats. The best time is late at night. The smart ones don't need a harness at all - they walk with me, either one of us leading, and hide instead of running away if we meet a dog, car or unfriendly cat. Sometimes I put a harness on them but don't hold the other end. That makes them easier to find and catch, and slows them down a little. But the harness I use is much simpler and more comfortable. Readers interested in being active their cats should check out the public Facebook page of Jafari the Jogging cat. Jafari is a cat living in Vancouver, BC who is known for his walking on a leash, trail-running, jogging, travelling and generally active life with his owners. You will see a number of tips on being active with your cat on his page (which is in no way a commercial website). Cats are far more trainable and social than people realize. As this article pointed out, many people think that cats just want to be left alone and wonder why their cat is so frustrated by living in isolation. Many of the recommendations made in this article are very solid ideas. Cat DO enjoy being active with their owners, IF trust and proper training have been developed. As with most cat training, it's far easier to begin with a young cat. Older cats may never transition to walking on a leash, but there are other things you can do with your cat to keep it sane and happy. There are lots of things you can do with a cat that cannot (or will not) go outside. Circuit training is a great way for both the owner and the cat to develop trust, be active, build a relationship, and have fun. Do some reading and look at the ways other people are working with their cats, then introduce new routines slowly. You and your cat will be much happier and have a much more loving relationship. Dec. 30, 2011 at 10:19 a.m. When my cat developed diabetes that required two shots of insulin daily, we trained him to take the shot while eating his favorite treat, broiled chicken. After a couple of days, we could give him a needle in his scruff without him even noticing. We also have trained our cat to wear a harness so we can take him out to our studio when we're out there. I've never been able to walk him to the studio - just harnessed him, leashed him and carried him so he couldn't get away. I know I can train him, and with these tips, I'll have him walking on a leach in no time! I'm passing this article on to a friend of mine who has not had success of integrating a new rescued feral into an apartment with two other cats. She already has him on a leash to avoid flying fur, and is going to take him for walks. He's very similar to the cat shown. Saving lives (shelter or homeless) cats, means keeping them safe for life. Well done for finding this solution. Dec. 30, 2011 at 7:44 a.m. This is ridiculous. Strictly speaking, cats were not domesticated by humans; they domesticated themselves. They only approached humans for food, and that's why they are more independent than dogs. We are really making them sick and twisted now. Dec. 30, 2011 at 12:59 a.m.
Just a wee bit of amateur zoology Anna? Cats no more "domesticated themselves" than dogs "domesticated themselves". Both cats and dogs undoubtedly first approached humans for food first, then bonds of trust began to develop. Cats and dogs are simply different animals, with different psychology and drives. Some cats do extremely well constantly traveling with their owners, some do not. Same with dogs. Same with humans. It doesn't make a cat "sick and twisted" to encourage it to try activities it may be perfectly adapted for. Dec. 30, 2011 at 1:12 p.m.
Whatever happened to the indoor outdoor, just letting them roam free. I guess it is not feasible on the seventh story, but I lived in a small apartment in a neighborhood in a nice college town, and I would just leave the window open a crack and my cat would come and go as he pleased (my roommate at the time has him now). Some days he would be gone for hours, and sometimes bring back a bird or mouse, and others he would want to just hang out at the apartment. Sometimes if people would be over and they would see him run outside they would say "oh no, your cat got out" and I would say "it's ok, he's a cat, he'll find his way back". He never got lost and my old roommate does the same thing with him where he lives now. My neighbor did that. One of her cats was killed by a fox, the other fell down a storm drain and died of his injuries. Fine if you have acres of land--and even then, expect your cats to live much shorter lives. Personally, ours are family members and we want them to stay with us for as long of forever as if possible! I looked at one of the cat pictures in the article and he seems to have extra toes on his front paws. These cats are called Hemingway cats. (Google it) My neighbor has one exactly like Mac and he walks daily, visiting my Calico, Zoey, at the back door. If I get one of the harnesses I will train Zoey and she can walk with her friend, "Hemi". My bengal took right to a leash when he associated it with getting outside. He would drag me around checking out the neighborhood. Indoors, he let me know he wanted a walk by batting at the drawer with the leash and collar in it. I wish I'd known about these types of harnesses, as I had difficulty finding a standard kitty size large enough for him and tried out ones for small dogs. I did have to wear thick sweatshirts though even in summer as he had respectable claws and I sometimes had to pick him up to avert a loose dog encounter. One time a big delivery truck roared up unexpectedly while I was holding him and it was like juggling a chainsaw - my shirt was completely shredded and bloodied. He trained me to get very observant when outdoors - for both our sakes! For easier tasks, and with a motivated kitty, you can easily train them without even food treats. I've never had a problem, for example, training cats to come when called. I currently have five kittens, and by three months I could get them to come just by standing at the foot of the stairs and calling "Here, guys, come here!" or by standing where they could see me and tapping my fingers together. And all I did was I called them several times a day and pet them as soon as they came even a little bit closer to me. All it took was time and patience. Dec. 29, 2011 at 10:24 p.m. This article reminds me of when I was 11 and tried to take my outdoor cat out for a walk but all he did was curl up into the fetal position. However, I now have a feisty indoor tabby who is always trying to get out. Just might give this a try. For many years, as a cat owner, I always imagined the thrill of being able to leash my cat and go to the park or just go for a walk. Alexander, our beloved cat, enjoyed walking on a leash. He liked to walk outside as much as possible. When we went overseas for an extended period, he accompanied us. People in the airports couldn't get over seeing him strut past, tail high and clearly happy about what he was doing. After my cardiac bypass surgery, my indoor cat suddenly demanded to be out and she would not return. she simply took off. She had lived with me in a large apartment, then a house with access to the yard, and then a tiny apartment. She was without me for about ten days. . I don't actually walk my cat, but I do take him out on his leash an harness and let him play outside in on our patio. I have to watch him carefully, least he get tangled up in his leash, but he gets a chance to be outside safely. Only if the health of the cat determines the use, not the egotistical needs of the owner, nor the profits needs of a consumer society, rather than the health needs of a humane society. (Please do not train your leashed cats to hunt, capture, kill and eat birds while leashed). All my cats have enjoyed going on walks but it was easy as most of the time I'v lived in rural settings with dogs so the cats just came along after a while. Though my beautiful large tuxedo Moochie who lived in and outside in the middle of a large city for a few years would go anywhere and thrived on terrorizing dogs via his total lack of fear. He would always walk straight at them with a rolling panther like stroll. It was not unusual for neighbors to ask me to "keep that cat away from my dog," or "what the hells with that cat?" Fortunately no dog ever called him on it. Moochie also liked to lay in the middle of our narrow, one lane curvy little street refusing to move until the offending car stopped. Somehow he knew that this was a bad idea on other streets. He lived for seventeen years dying of old age here in the Cascades. I've tried a harness on my cat with just the two straps... no luck. I think he might go for a harness like the one on Mac. Where can I get a harness like the one Mac uses? What brand and style is it? I had a cat whose favorite activity was going for a walk -- without a leash and only at night, as he was shy about other people. But with me at night, Bubba was quite the fearless adventurer. If we didn't go for his nightly walk, he would act out in all kinds of ways. "Going for a walk with the cat" was never something I set out to do -- it just sort of evolved from him following me out to the car whenever I'd go someplace (he'd also be waiting when I got back to the apartment complex -- he could recognize my car, regardless of where I parked). My neighbor's cat also loves to go for a walk, sans leash, day or night, whenever the dog gets taken out on his leash. Dec. 29, 2011 at 10:23 p.m.
My wonderful old Hobie Cat came when called and acted like a dog - a leash was not for her, though. Of my current two cats, the gray tabby believes in her heart that she is a wild animal who belongs outdoors - despite my warnings that hawks, owls and foxes would eat her. The tabby/siamese mix is more prissy and wants little to do with the outdoors. My solution: catsondeck.com, which (after much searching) I discovered is a well-built contraption you can create to suit your needs and whims (large or small), that will survive Wisconsin winters, and more. My cats love it. Using tiny bungee cords, I added a "hammock" I bought on etsy designed for ferrets, and they love it even more. And no worries about the real wildlife eating my cats (although the Springer spaniel inside sure gives them a run for their money!). Dec. 29, 2011 at 8:35 p.m.
That jacket looks like a good idea. One of my cats loved going outside, so I'd strap her into a little chihuahua harness and off we'd go. However, one day she looked at me, meowed and shrugged the harness right off. I said, "oooh, you shouldn't have done that," but she had already taken off like a shot. I did get her back after a hearty chase, and that was the last time she went outside (except when she'd escape, the little sneak). Dec. 29, 2011 at 6:17 p.m.
That said, cat walking does look pretty fun for both cat and human. I have lived with enough cats to do some statistical analysis. In my experience, only about 20% of cats will naturally take to the leash. Most of the rest will just flop down and refuse to move, or panic. Walking your cat is a nice idea, and it's great when it works, but don't try to force your cat to do this because you think it's trendy. Many of the cats that panic will run right into the street. I would agree with this. Not all cats will take to a leash. Just like people, every cat has it's own personality, capabilities and interests. Some cats are content to do little, some cats need to be busy all the time. Keep trying new activities with your cat to see what your cat might enjoy, but as the above writer suggested, don't try to force you cat to do anything. Take all training slowly and gently. It seem you have adopted the reincarnation of my little girl Ducks (so named for trying to kill them when she was 4 weeks old and less than 3.5 lbs...and she never got too much bigger.) We never could train the little hellion, but she trained us just fine. I always had the only cat in a hotel room where an open window is the equivelent of a cat door (and she always came when called, unlike my current dogs.) rip Ducks..14 and died fighting muskrats...just as she would have liked (after having brain cancer (could not be treated so don't get sappy) for almost 5 years. Anybody got a long haired calico kitten? No, but I have two short-haired ones. They'll be spayed in two weeks and free to a good home ten days later. DARLING kittens. REALLY. Anyway, after searching for her for a year, I had to believe that she was dead. I also knew that she wanted to be reunited as much as I did. And I believed that she would reincarnate - but how would I find her? That was the question I asked her in my heart. The answer came a few days later in 2 dreams on 2 successive nights. First an image of an orange tiger with a black streak on its thigh, then an image of an orange face with a black strike across its forehead. Then I went to the local market and saw a flier with a photo of 4 kittens - the dream cat was one of them. I got her. My husband suggested we name her something very close to the other cat's name. i couldn't do that - but after trying several other names for 3 months (none of which she responded to - cats DO know their own names, we just have to discover what they are) , I did try the suggested name - and she responded immediately. She is very much like her former incarnation in this one - the 3rd of her lifetimes in which we've been together (that I know of). So, Mary, ask her to return, and wait for a message on how you'll know it's her. Best of luck with a reunion. We've been walking our cat on a leash since she was a kitten. She's traveled to France and back, and enjoys going on hikes with us. Our routine of walking her ends in the city, unfortunately, as the attention of dogs and people just freak her out. Much of her outdoor play time was curtailed this past year due to getting a dog, and a kid. Shame on us for not figuring out how to balance the needs of all three little ones in our care (cat/dog/kid). Next step is to build her a little outdoor cat shelter with deer netting so she has some space for herself to do her cat thing. You have an adorable cat--he looks so serious out in the park. I'm not sure that I would have the patience to train my indoor cat to walk outside on a leash, but it does give food for thought. I started walking my cat on a harness when she was a kitten. She wasn't fond of the city streets. Now ten years later, she takes me for walks around the yard at her leisure. She avoid birds at all costs as she was dive bombed by nesting sparrows during one of our walks. I have been walking my Siberian on a leash attached to a harness for a couple of years, just around the yard - he loves it. But - beware of ticks - if you are going into woodsy locations, even a bit of long grass can harbor ticks that carry disease. Always check the cat for ticks after a walk. And using monthly tick prevention treatment is even better. If you find a tick on the cat, do not handle with your bare hands. Look online for detailed instructions on removal and how to destroy it safely. By the way, to the gentleman who complained that cats don't taste sweets, I believe that is true. But cats will regard even their regular dry food as a "treat" if given in another context than regular feeding. My two kitties get a few bits of regular dry food as treats in the evening - and they think it's wonderful. To would-be cat owners: Adopt. Spay. Neuter. Repeat. And enjoy! Orange tabby cats are known to be very personable. I've know several including one of my own. He acted like a dog: he took walk with us on our wooded property and he was very interactive with people. He certainly had a mind of his own; nothing passive or retiring about him. Leave aside the issue of whether ethylene glycol tastes "sweet" to cats, they are attracted to it and it is a miserable way to die. http://www.cat-world.com.au/ethylene-glycol-poisoning: "Even as little as a teaspoon or two is enough to kill a cat." Honestly I wouldn't like to walk my cat ( Balinese) in the new york streets, it is crowded, extremely noisy even a human and many times for little dogs too scary. I and my wife driving to sevenlake national park which is relatively close distance or finding in the central park some relatively silent places, this is absolutely necessary for them, because they love grass and trees. Cat's as much as dogs love outside but in a different way, never unleash them even they are the most calm one. Driving car with them is more pleasent than anything, imagine that your cat is sleeping on your shoulder, like expensive fur around your neck , pleasent warm ( in winter it is addictive) also littel massage effect , no stress at all calming you down even in very bad traffic. they really know that place , our cat stayed on my shoulder from NYC to Montauk. Cats are another delight for outdoor stuff, not them the owners need to adapt, because they are not dogs. From our living room window, my cat used to watch dogs being walked and somehow I got the idea that he wanted to do that too. Now he happily trots along side me on our walks, just like the dogs, and it is the highlight of his day. My cat came to me fat. I made him svelte. My cat wants to get fat again, and will eat anything that he can consider food: canned peas, ramen noodles, Doritos, cheesy crackers, beans from burritos. He goes wild over Ethiopian and Indian food--he'll try to knock it off my fork. He's even tried fresh corn on the cob (he stole the whole cob from the garbage can and dragged it under a desk, leaving a halo of chewed up kernels and germ) and nibbled holes into a bag of bread. I trained him to harness but direction and distance was democratically decided. I got him as a second hand stray, maybe about 5 years old? He's at least 16 now and looks less than half his age. Has more courage and is friendlier with people than my rescued dog, which is another story. I tried a collar and leash with our female tabby but she only wanted to back out of it and wouldn't move. I immediately tried letting her go loose outside our home and just following her. I set in my mind a distance of 100 feet or so in any direction from our front door (there is no traffic around closer than 300 feet from our door). When she reached my distance limit, I let her know to stop by scolding her, picking her up (she HATES to be picked up) and then immediately taking her back inside (which she didn't want either). After one week of this practice she would stay with in the boundary's I'd established (most of the time - she's a cat after all). She will respond to voice commands and return to me (complaining all the way, but returning none-the-less). I always stay with her. After over 5 years of this she now is more of a sitter outside, but she does love her "walks". She is a hunter but not a killer. What she catches she lets go after tryin gto bring them into the house. Two of my three cats (Miss Cush and Miss Tout) loved the outdoors, but I never found good harnesses like the one pictured. I used an extra long leash(10-15 ft.) to let them roam around the front and back yards. The length gave them the sense of independence they craved. They loved going outdoors and let me know by clawing at the leashes or the front door knob and would similarly walk to the door when they decided it was time to go in. I swear they sometimes seemed embarrassed whenever a passing neighborhood stray would see them tethered, but deep down, I think they knew they were lucky to be a part of a family. Be sure to have your cat spayed or neutered. It will then be more content to stay indoors. We started by putting the harness on - and leaving it on. The cat acclimated to it in about a day, and then it was like wearing a collar: no big deal. We took her outside and put a stake in the ground, attached a short lead, and let her sit while we set up beach chairs and read. She sat for a spell, walked a bit, sat a bit, walked a bit, until after a few hours she was straining at the end of the tether. From that point on she understood that the leash meant "going outdoors", and she waits eagerly at the door at the first sign of the leash appearance. She also walks into the cat carrier, thinking "this means a trip to fun" (which is usually the RV, but occasionally the veterinarian). Some days she walks and sits (as cats do) and some days she walks with purpose and covers a lot of ground, and sometimes she jumps on a tree and scrambles up a few feet until I stop her, and it's fair to say "she walks me" rather than the other way around, because it is nothing like walking a dog, but she enjoys it, I enjoy it, and what else is there? Dec. 29, 2011 at 6:13 p.m.
Our Pookins is 20 years old and she stays in unless we go outside with her. We have an acre in a rural area although the road in front of our house is very busy. Ozymanda, on the other hand, was a feral that came to us from the woods. During the nine months that she has graced us with her presence she has been spayed at a clinic that was equipped to handle her wild self and recently she had her first visit to the vet to clear up some issues, including infected eyes and stomatosis, an serious condition of her mouth and gums. She is flourishing despite not being allowed in the house, which is the royal domain of Pookins. She has a pet door into the separate laundry room, where she sleeps, and also into our detached studio/garage, so she has "refuge" from the coyotes. The vet said that she is probably seven or so years old and we figure if the predators didn't get her when she was wild that she is probably somewhat safe now. She has no apparent interest in birds and we've yet to see that she's done any mousing in the studio/garage despite the fact that we know they are there. She is apparently satisfied with her five meals a day and cannot get enough attention now that she has been, I suspect, re-domesticated. I cannot imagine having either of them on a leash, but for those who are able to have their cats on a leash, I congratulate you. It does seem like a viable solution for those who have the patience to make it work. Finally, congrats to Mr. Galaxy on making such good money. Dec. 29, 2011 at 5:06 p.m.
For all that people claim cats and dogs are different? Mr Galaxy's techniques that focus on positive reinforcement and setting the cat up to succeed are identical to those used by many dog trainers. Also, for the person whose dogs were barked at? I apologize for my dog. She's bad with other dogs and no amount of obedience classes has seemed to solve it. We try, but we still get growly sometimes. Dec. 29, 2011 at 4:17 p.m. Both benefit from positive reinforcement, of course. But you're missing the most important difference between dogs and cats - the fact that dogs have an inborn drive to want to please their people, while cats do not. This makes a tremendous difference in training, making cats significantly more difficult and limited in what you can achieve with them, how, and when. Motivation is key in training, and motivation in cats and dogs is just greatly different. So, people's claim that the two are different deserves some merit, because they are. Dec. 29, 2011 at 4:25 p.m. I have walked with my Turkish Angora since he was a kitten. He has a huge amount of energy and walking subdues it a bit so he's not racing around the house or screaming all night. It was easy to get him to like it as well. I think the cat breeds that are more dog-like respond very easily to the leash. He took to it immediately, though it has taken several years to get him to respond to directional walks on the sidewalk in our neighborhood and not just I'm-out-the-door-let's-run" type of walks. He's six now and prances like a show dog up-and-down the street right next to me. It can be dangerous sometimes too. There have been two incidences with dogs: the first was frightening as the dogs got loose from a nearby yard and attacked after dark (our Golden Retriever went into defensive mode and amazingly, protected the cat); the second time, a terrier ran up and started barking (the cat was bigger than the terrier). So, I have learned to be extra vigilant, especially at night (which I rarely do anymore). We have 5 cats, but this particular one has the most energy, and is the only one we have been able to leash-train. He's also the only one to have crossed the US by car four times and visited many New England states as well. He likes to lay on the dashboard on long trips. I have often thought of pasting those old-fashioned travel stickers found on luggage to his cat carrier to show where he has been. Which begs the question: Can we get him to Europe? Dec. 29, 2011 at 3:32 p.m.
Dec. 29, 2011 at 2:38 p.m.
None of my 3 current cats are even remotely interested with the outdoors -- a marked difference from our first cat, who passed away at the age of 14. I tried taking my biggest cat out for a walk once -- he is extremely docile and fat so I thought the exercise would do him good. When I took him outside on a medium dog harness, he laid down and went to sleep. This happened a second and third time till finally I gave up. He chases toy mice instead. When he feels like it. Dec. 29, 2011 at 1:49 p.m. I'm really excited about this and can't wait to try it. We have one cat who normally isn't the adventurous type but recently has been displaying signs that he wants to go out and explore. We also have a cat who was born a brave explorer and conqueror of new worlds. They are both indoor cats who have never stepped foot outside past the balcony. This sounds like a great way to make them both happy and give them chance to stretch their little kitty horizons. Thanks for the information! Dec. 29, 2011 at 1:46 p.m.
Like I said, cats can't taste sweet. Hilarious. No, they can't. But they're splendid all the same. Fine, she should have said "glycol tastes good" not "glycol tastes sweet". Not exactly a major issue. So my puppy is in love with the candy canes on the Christmas tree but her feline companion disdains the stolen treats. Thanks for the explanation. I cannot imagine anyplace outside that I would feel safe walking my cat on a leash. I would be too afraid of a dog coming out of nowhere and attacking my cat. I cannot think of any way to handle that situation that would prevent serious injury to my cat and probably also to myself. I would love to take my cat for a walk on a leash but I don't think I will be attempting it. My primary concern is the safety of my cat. Cats can't taste sweet. Dr. Stephen Zawistowski, science adviser for the A.S.P.C.A. should know that. Credibility means something. Now, what else in the article is wrong? Dec. 29, 2011 at 1:45 p.m.
Cat's can't taste sweet doesn't mean that they don't have taste sensation, they can taste other tastes. However they can eat many sweet things very lovingly but I believe that this is coming from other ingredient feature more than glucose or fructose. The best part of this video was watching Mac attack the woman's leg. I got a good laugh at this because I used to think my cat Spoon was just "full of the Old Harry" when she did this to me. Glad to see other cats doing it to their owners. I let Spoon outside in the backyard (fenced in but not escape-proof) on Saturday or Sunday mornings when I can keep an eye on her. When she escapes the yard, I go outside and call for her - "Spoon!" "Spoon!" "Come to Mama!" And eventually she does come home to me. She'll beg to go out at all hours and I simply tell her "Nice cats don't go out in the dark of the night." This seems to convince her that she's not getting out. my cat is a maniac. luckily living in queens, we (and our neighbors) have yards, so i havent had to resort to walking him. but a few hours without a trip outside and hes causing all sorts of trouble. and of course outside he causes even more trouble, namely seeing scattered body parts of birds all over the place (could you imagine if he wasnt neutered). this might be one for the future when i move deeper into the city. you guys can start the trend this way i wont look as crazy with a cat on a leash! I've gotten my cat to come when called, sit, give me her paw, hop or off on a stool on command. Positive, consistent reinforcement is the only way to do it. It doesn't get much better than that - you gave your cat an opportunity to experience life as a cat - not just as a pet - an opportunity he deserves; and he's happier, and you're happier for him; and he loves you for doing everything you do for him. and thank you for sharing this touching story. Dec. 29, 2011 at 1:38 p.m. I agree on that, what is difference from cat and dogs, is cats wouldn't like to obey homo sapiens incessantly, there are sharp moments they revolt or strike back, which I admire them for this, a domestic cat is a very small animal but never retreat against a big animal such as Homo sapiens. They should be let free at home, but of course socializing them is possible as much as they voluntered or permitted. Domestic Cat and Dogs are unique animals in evolutionary history, they join homo sapiens evolution voluntarly and adapted or co-evolved. For this reason I never appreciate other than cat and dog adoption, rest of the animals should be free in wild life, snatching poor animals from their wild habitat and bringing in human civilization is one the worst and cruel act. Feeding and giving shelter to one animal is not always enough, Animal should be adaptive this one so far science discover only two species (may be mouse too) lets be respectful our own evolution, animals evolution but more their life style. How on earth boa constrictor or Cobra snake can be a pet ? Dec. 29, 2011 at 3:28 p.m.
My 17lb, 14 year old Siamease walks with me throughout our neighborhood without a leash. We started while living in an apartment taking him out as recomended by the author. We moved to a house with a yard and once while he was out he walked with me to my bus stop. On his own. Next he started directing me to places in the neighborhood he wanted to take me: Constuction sites! I think he loved the dirt and saw dust. We have three other cats. They want to come on our walks. The old male lets them but trains them to walk with us, pay attention when crossing streets, come to me when I whistle and to thoroughly enjoy our time together. Cars stop when they see the five of us walking together on the sidewalk and peolple point. I know the problem with off leash cats and wild song birds. We teach them to grow out of hunting but not before some kills. Balancing our animal companions happiness with nature and living inside is tough. They've taken the lead and we do the best to keep up. Dec. 29, 2011 at 1:37 p.m.
I’ve been walking cats on a leash for over a decade. A leash can add a whole new dimension to your indoor cat’s life. I had unrealistic expectations that I would be taking my cats for a walk The cat is taking you for a walk. We’ll walk a foot or two, then stop to observe flora & fauna. After a while, we’ll walk on , and so on. If you need to walk somewhere, don’t bring the cat. Most cats will not want to wander very far. There is no point in forcing them to do so. The point of the expedition is your cat’s mental health, not exercise for you. If your indoor cat is afraid to go out at all, don’t force them. However, you still should get them used to wearing a harness. In the event of an emergency, you may not have a carrying case to put him or her in, or you may need to take the cat out of the case in public. (With increased security at airports and elsewhere, you may very well have to remove your cat from the case at the security checkpoint.) With a harness, it will be much easier to hold onto your friend. • Your cat will love nighttime walks. • Always attach the leash to a harness, not a collar. The best result has been the end of my cats’ obsession with GETTING OUT. A leash and harness can be a cheap way to let your cat enjoy the outdoors, and it could be a great help in any emergency. Dec. 29, 2011 at 12:14 p.m.
Also great for indoor cats are cat houses. It can be as simple as a multi level raised screened/chicken wired porch for the cat where he can sit outside, nap, watch animals but stay safe. My neighbor had one on the back side of her house. The cats accessed it via a cat door about five feet off the home floor via a small ladder. It was located under a large porch overhang but people also build them with roofs. A few owners also go crazy and add tunnels, toys and you name it. I think all cats should be indoor cats. Since the cat will likely live longer with no ill effects and does not die painfully by coyote or car tire, it is irresponsable not to. I second Mr. Galaxy's advice on traditional collars & even the modified collars with thin straps. A harness, such as the one shown in this article is best. Cats are notorious "squirmers" & can easily escape from harnesses with thin straps. That's what happened when my (now ex) boyfriend & I attempted to take Pnut out for a stroll on a quiet street in Bed-Stuy. Over 2 weeks, I'd gotten her conditioned to wearing the harness (it had a thin strap around the neck and one around her upper torso). When she was comfortable, I wrapped her in a towel & took her a block way to a quiet side street. The moment her feet touched the ground, she bolted & ran as far as the leash would allow her, through a fence & into a neighbor's small garden, tearing up the tiny plastic white picket fence meant to delineate it, & uprooting a few plants, too. I was mortified! Don't worry. She ducked into a church vestibule & my boyfriend caught her. She lived to squirm another day. My husband rescued our cat Gravy, during a trip to Arizona and since we thought this little kitten might like to stretch her legs during the drive back to Washington, we bought a little ferret harness for her. Now full grown, she goes outside always with a harness and when outside of the backyard, a leash (and me) too. She has trained me well, every morning my meep/meow alarm clock goes off, then it's off to open the blinds, spoon out the food, harness on and outside for a walk to gaze at birds, eat tender grass shoots and charm the neighbors. I love that I always have an excuse to go outside and just "be" for a little while, it makes up for the fact that I live with a benevolent tyrant. I tried training one of my cats to walk on a leash. I downloaded the instructions from the ASPCA site and followed them. But he got spooked when we finally went outside. So I gave it up. I had to laugh remembering an occasion several years ago when I tried to walk a cat on a leash. Our family was moving and when we stopped for the night at a motel en route, we leashed both the dog and the cat so neither would run away. The dog was resentful (used to having full run of the territory), but the cat was simply having none of it. Period. There are still people somewhere in Oregon who perhaps remember a tired and embarrassed young woman with hands full of kids and luggage "dragging" a dead cat on a leash across a parking lot within view of the Columbia River. I just hope they don't remember what she was saying to the cat. Years later a scientist acquaintance told me of a phenomenon he'd seen when cats have something bound around their mid-sections - they simply collapse and seem to be dead. I don't know about the science in that, but I do know about my "dead" cat in the parking lot. Of course, the cat slipped the leash later and ran away, but did return in the morning to continue the trip to our new home. After living a few years in New York, I know that New Yorkers are willing to try anything - God bless 'em - and maybe they'll get this "cat on a leash" thing to work. But the cats are just going along with it until they decide not to. My father takes his cat out on a walk for an hour every day. Both human and cat greatly enjoy the time together; the cat is able to climb trees but not so high that he can't get down (because my father will snub the leash); he can capture animals in the shrubs freely but does not run the risk of getting hit by a car on the road because he won't ever get that far chasing a critter. When my father has finished listening to a symphony or two on his mp3 player, he will say to the cat, "Home," and the cat will briskly trot back to the house. When the cat has had enough, he will run back to the house with my father in tow. So, yes, it is very possible to train a cat to walk on a leash in a way that it benefits from the outdoors. I have two cats and in Oregon my cats could come and go at will through a cat door and loved racing in our back yard, climbing trees, ect. Now, in NJ, we live in a small apartment on a busy street but I've been taking them out for "walks". One, however, is terrified of everything and trembles like crazy. I have stopped taking her out. The other always wants to go out and I use a cloth harness that looks like a little like a muscle shirt on him and has the elastic cord that one person recommended. It is a very good, safe choice. What I've found is the cat that likes walks is getting used to things slowly, but is still VERY easily scared and COMPLETELY freaks out every so often, lunging and leaping and scrambling in blind, total fear, to the point that I pick him up and bring him in right away. I also haven't bothered with the treats as suggested, the treat for my cat is getting outside so I don't need to use extra rewards. Both cats are young, 3 - 4 and I wish I had started them as kittens the day I brought them back from the shelter. I think that's the best thing, if possible. Start them young. I've traveled with cats, even hiking over the Canadian Rockies with a kitten perched on the top of my pack. I've seen many homeless people with cats on leashes. It can be done, but check with the cat first. No reason to terrify the little things if they are happy inside to begin with. Thank you from from Puskin and Lutsa, and in memory of 42 and Mary Oliver. My cat Otto is the ripe old age of 22 - he will be 23 years old come January 2012! When I lived in NYC for 11 years he craved getting out the at door in order to climb the building stairs and hang out every night at 11 pm. That was the highlight of his day. Now that I live in Fort lauderdale I've introduced a leash to him and he enjoys walking on his leash around the condo. It is safe and it makes him so happy. I truly believe that this sense of freedom for him has helped him live longer and happier than the average indoor cat. Otto is truly a special little guy. Thanks for writing this article...! I have walked my cats for over 6 years now. I adopted them from the street so they have always been indoor/ outdoor and we have a kitty door that lets them do that. While walking them, I dont even use a leash, they just follow me along the side walk throughout my community. They absolutely loooooooooooove walking with me. As soon as I get back from work, they make a beeline for the door ready to go for a walk. Just a reminder, they can go outside by themselves and yet they really really want to go out with me. I have trained them to trust me. It brings me such happiness that I can do this for my cats. Trust your cats and let them enjoy the outdoors where there are trees and no cars. They will thank you by being super good natured and super affectionate. The best training device for a cat is the long leash and the choke collar as is used in the Disney method of dog training. I believe the element of the surprise using the long leash with the sudden choke really keeps the cats in line when walking them. Sorry, please reread the above article about positive reinforcement. Training an animal by yanking on it's neck and choking it is from the dark ages. Dec. 29, 2011 at 1:47 p.m.
You're kidding, right? A choke collar should only be used on a dog that's stronger than you are. Anything else is cruel. Of course, if you love your cat, you use food, cuddles, and positive reinforcement. It works just as well, and it's not malicious. Great article. I trained both my Burmese cats from the time they were little to walk with their harnesses, and even now, my one remaining 15 year old still wants to go out. After a while, they were smart enough to know where the boundaries of the yard were and we could walk with them without needing the harness to keep them in check - they would never go past the boundaries, and go right to any of our three doors when they were ready to go in or if they perceived a threat! I live in the suburbs, and all the cats who used to visit and roam free in my yard have long disappeared - I'm sure, victims of the foxes, coyotes, and maybe even the large hawks! I found the cats very easy to train when they were young, but for those who rescue adult cats, this is a great way to teach them. It does definitely enrich their lives. A few years ago, there was a gentleman at the Crafts Fair at Lincoln Center, and he had a Burmese with no leash who sat at his feet in the crowd and the noise and seemed perfectly content! To this day, I am completely amazed. He said he trained her from when she was a kitten. So yes, cats are very trainable, especially Burmese! Cats come alive when outdoors, however you manage to provide the opportunity. Indoors, they might as well be furniture. Just to emphasize- don't ever use a plain collar and a leash, much too dangerous. But a cat that can survive a trip on a NY subway is a very healthy cat indeed. I'd try for a walking-distance park instead, even if it involved carrying the cat with some risk of getting clawed a bit. Even a small fenced vegetable garden can be pleasant for a cat off leash if you can supervise a little. I once had a siamese, who, being doglike in other ways, would walk with me in a large nature preserve and never run off, and I never had to follow her up a tree! She would get tired in less than a mile, though, and ride shoulder home. Hooray! A responsible cat owner that recognizes the cat's need for diverse stimulation but also takes into account the cat's magnificent hunting skills. This propensity for mischief has benn categorized by US Fish and Wildlife as an ecological disaster, due to the hundreds of millions of free-roaming and feral cats that heve been irresponsibly released on American wildlife. Cat owners need to consider controlling their pets, just as dog owners have. It's important for the comfort of the neighbors as well as the future of our wildlife. FYI- The numbers of American migratory songbirds have declined by 50% since 1960. It's time to give the birds a break from these expert predators. Dec. 29, 2011 at 11:13 a.m. Yes, all this is true. No doubt cats devastate wild bird populations. However, the greatest number of birds killed annually, migratory and not, are killed not by cats, but by flying into windows, especially sky scraper windows, plate glass windows. Deborah - I know you mean well but your facts are wrong and leading to needless bad decision making. All house cats should neutered and kept indoors, full stop. Letting the cat out exposes it to many dangers -- air borne diseases, cars, dogs, etc. The cat can also bring Lymes-bearing ticks back into the house. However, the proper management of feral (as opposed to stray or abandoned domesticated cats) is a whole other story- properly managed trap-neuter-and-return colonies are best to slowly decease the wild cat populations. emphasis, tho, on properly managed. meanwhile, the biggest reason for the decline in song birds is human development destroying their habitat. So if you want to gang up on shopping centers, McMansions, and the like - I'm all for that! When we adopted a younger cat last year (who lives with other indoor/outdoor cats), there was the fear that she would get out and get lost. Therefore, when the weather got better, we introduced her to her neighborhood by way of collar and leash. She had about 15 feet to explore as we sat on the porch, and did she ever explore! After about four months of collar and leash, always with one "human", each afternoon, she was let out on the porch. She did not seem too interested in leaving familiar territory. Of course, that changed as time went on, extending her territory further, in increments. Fortunately, we have a very solid male indoor/outdoor cat who took the lead and watched over her, but we still stayed on the porch to let her know she had someone in which to return. Is this optimal? Probably not, but we felt we had given her time to adapt to her environment, and understand where she lives. Dec. 29, 2011 at 11:11 a.m. In the 1970's, when I lived in a studio apartment in New York, I had two Siamese cats -- a male and a female, the male about a year older than the female. I began walking the male in a cat harness when he was young, in the park near my apartment. As my second cat grew big enough to go out, I walked both of them together, each one on a harness. The smaller cat was more easily spooked, but she was fine, when she became used to going out. Dogs in the park were on leashes, and did not bother us. However, cats do not heel -- they walk in whichever direction interests them. Often, with two cats, I was pinned to one spot, as they went in opposite directions! It was fun for us all, but it required patience to get them moving in the same direction! Dec. 29, 2011 at 11:01 a.m.
max's harness: where, how can I find that model? Dec. 29, 2011 at 9:01 a.m.
Hi Esther -- I bought a walking jacket from kittyholster.com that Mr. Galaxy, the cat behaviorist, had recommended; you can find others at metpet.com or via a search for "cat walking jacket." Mr. Galaxy recommended trying a walking jacket instead of a harness to start with. He said a jacket is harder for the cat to back out of, and requires a little less fiddling to get it to fit than a harness does. I hope that helps! Dec. 29, 2011 at 11:59 a.m. I believe the one in the article was for a Chihuahua, but here is one specifically for cats. It looks just like a version of the small dog harness I bought for my cat; I've also used rabbit and ferret harnesses which worked great until my cat got too big for them. I've walked my cats on a leash for about three years now, and yes, you are seen as that crazy cat lady, but it's worth it. My boys look at it as a special treat, and come running when I pull out their leash. Letting your animals out to roam freely is a decision that has many factors-location, the temperament of your pets, neighbors, etc. I don't think there is any hard or fast rule about it. I've been walking my cat on a leash since he was a kitten. I also keep him on a 100 foot rope in the yard. He knows no other way even though there's other cats in the neighborhood that run free. When I open the door for him to go outside, he just stands there in the door until I clip the rope on his collar. "Pico" is gonna turn 13 in February. We have always lived in a high traffic area where I see dead cats in the road often. I feel if I didn't keep him on a leash/rope that he would of been a casuality also. I wish I had know this before our beloved family cat was most likely killed by wild coyotes when we let him roamed outside as we thought we should do. Thank you for the article. Dec. 29, 2011 at 7:38 a.m.
What a treat this article is! I just started the hunt for outdoor walking attire for two foster cats, and this will get us all going safely in the great outdoors! Back in the early '70's we walked our cat in the park on leash, and, yes, our neighbor walked his rabbit! My cat was a six month old, mostly feral cat when I got him from the SPCA. I tried to keep him inside and it was a nightmare. He is an inside/outside cat - mostly on the front porch when he's outside. He REALLY prefers being outside. He goes to the vet regularly and is up to date on all his shots. Being outside most of the time hasn't seemed to hurt him or shorten his lifespan - he's 15 years old and still pretty spry. Of course, we don't live in a big city. Dec. 29, 2011 at 7:37 a.m.
Leash walking is excellent but there are three cautions one should be aware of. The first is that cats can unusually manipulate their shoulders and this means that they can suddenly turn to face you, pull hard and wiggle, and slip out of many if not most harnesses, which they often do if suddenly frightened. Practice a lot indoors with snug behind front legs fit before trusting it outside. But be careful not to restrict breathing. The second is that most all figure-8 or H-harnesses have a loop around the neck. This means they can pull directly on the throat, especially if the cat jumps or runs forward as they frequently do to investigate a bug or something. It's like getting a punch in the windpipe. Third, without mentioning brand names, there is a harness and leash combo that avoids the latter two problems because it comes with a bungee-type leash. The cat quickly learns from that mild tugging pressure as it extends, precisely when and how far the leash will suddenly pull taught. This results in no "punch" to the trachea, and no punch even on a leap, because the "collar" part of the included harness pushes on the breastbone, not the throat. Whichever harness you use, a leash that has a bungee effect is always advised and is a real advance in cat walk training. Check out http://aspcabehavior.org/ and search cat leash training for unbiased authoritative advice and full details of leash training and use. Hope this helps our kitty friends. Dec. 29, 2011 at 7:19 a.m.
but the harness they recommend is NOT one I would use as it is a figure eight harness and my cat pops out or chokes on such a leash. I really like the harness of the type pictured and would recommend it with the same proviso mentioned elsewhere - make sure it fits properly before taking the cat outside. I found mine listed for small dogs and had to get my big (tall not fat) cat the size medium. Also, I like the training as presented in the Times article better than that presented on the ASPCA site as I could leave the harness draped anywhere near my cat and he would ignore indefinitely but treats he likes and will readily respond to. Knowing I can pop my cat into a harness was a big relief when we had all the emergency weather - walking or not -being able to put my cat in a harness with a leash left me feeling like I had more options during the various emergencies (think evacuation). Dec. 29, 2011 at 12:41 p.m. I second the kudos to the author for training her cat to walk on a leash. Here's hoping that others realize they should walk their cats and not let them roam loose--doing so shortens a cat's life on average by 30-50%; it also means hastening the death of birds in your neighborhood. The average indoor-outdoor cat will kill 40 birds a year. They are a serious threat to many bird species and have an unfair advantage as domestic pets that are fed and taken care of but also allowed to hunt as predators. Oh, and they defecate in other's yards, spray, and yowl. So thanks to the author for being a responsible cat owner. There are so few. Dec. 29, 2011 at 12:14 a.m.
See my comment below. By all means, keep the cat indoors! However, the loss of birds is due to mostly humans development; there are no studies supporting the statistic cited since it is just no so. If you really love your cats (or dogs for that matter), then you would not keep them in the city to begin with -- cramped up in a tiny studio apartment, often with you gone all day. They are social creatures and need companionship AND exercise. A suburban side street, with little traffic, is ideal in my experience for a cat. Then can go outdoors with relative safety and live a natural life, able to hunt and explore AND social with other cats. Cats are territorial and no, your studio apartment is NOT a territory! Also in winter climates, cats do better in a house with several floors or rooms, so they have room to explore and run about and a variety of environments. This is especially true if you have more than one cat. Walking a cat on a leash is in my opinion MORE dangerous than letting them run free. All it takes is the sudden appearance of a dog, on or off the leash, and the cat will panic and run up a tree or similar. WIth a long dangling leash, the cat can be strangled -- OR an aggressive dog will catch the leash and pull the cat to his death. If your circumstances are such that you must live in the city -- follow the advice here. Get a fish tank. Or a caged bird like a parakeet. They do well in captivity. If you already have a cat in the city, then keep it INDOORS rather than walk it on a leash. Try to give the cat some extra play time, or a companion -- or hire a sitter for a few hours a week to give it some attention. Dec. 28, 2011 at 9:03 p.m.
How do you know a parakeet is any better off than a cat? Cats at least show that they are enjoying themselves and a parakeet can barely move inside its cage, let alone fly. Cats are domesticated animals and well adapted to city life. Cats who live a "natural life" outdoors are exposed to other animals (we have foxes here in suburban NoVa) a wide variety of diseases and all the other hazards of nature and of man--cars, toxic substances, etc. My first girl was a former farm cat who happily watched birds and squirrels from a city apartment and then from the windows of a suburban VA townhouse. We adopted a second cat to keep her company, but though they were always happy to see us and cuddle, they were fine while we were out during the day. She lived a long and healthy life until succumbing to a tumor at the age of 15. We now have 2 lovely cats who were adopted from animal rescue. They spend their days cuddled together sometimes, sparring at others, and watching the wildlife in our backyard. They hang out with my kids after school and with us at night. They LIVED the "natural" life and were happy to be rescued from it, to live in a warm safe house where they have plenty to eat and people to love them. And most cats will happily do the same. Kudos to the author for finding a safe way for her cat to enjoy the great outdoors. An outdoor cat runs the risk of getting ran over by cars, poisoning, attacks by other animals and humans (remember the crazy lady who dropped a cat in the trash bin?). I've seen too many dead cats and dogs on the street to ever let my cat outside. Better fat than flat I always say. Dec. 28, 2011 at 8:15 p.m.
for vet visits, please put your cat in a carrier, regardless of how well it may walk in a park on a leash. safety first.